Bullet Train Urinals do not have locks. 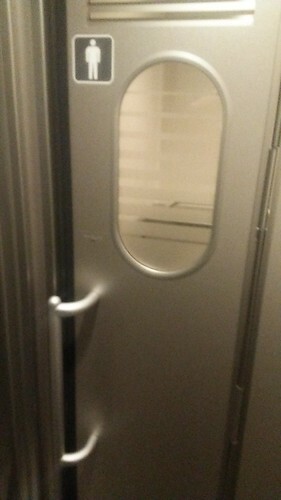 In place of locks bullet train urinals have windows which allow those outside to see if there is someone using the urinal or not. As a senior British male I find it a little uncomfortable to be seen while urinating, and still more for my being seen to be the only thing that prevents people from opening the door while I am urinating - not that anyone would barge in. Ideally I would like to be able to emerge from a toilette (Americans are so uptight they have to call them "restrooms") secure in the knowledge that those outside in the corridor do not know what I have been doing in the toilet (washing my hands, or even "resting"). In the case of a urinal cubicle, this practically impossible, but the addition of the window and the lack of the lock makes me feel like I have just urinated en plein air. Urinating outside is something that Japanese men did not feel uncomfortable doing as recently as 20 years ago even in groups. These days it is only young Japanese boys that urinate outside in groups. Using a Bullet Train urinal makes me feel an age younger than with which I feel comfortable. I respect Japanese men for the their lack of prudery. I note however, that Japanese women are so sensitive that not only would it be utterly unaccepted for them to be seen whilst urinating (kami forbid) but Japanese women use electronic devices (otohime) so that they can not even heard urinating. Japanese women can emerge from toilette cubicles in that ideal situation: no one can be sure of what they have been doing.